Researchers at the University of Liverpool have been awarded £1.3 million from the Engineering and Physical Sciences Research Council (EPSRC) to enhance the University’s capabilities in very high field 800 MHz Nuclear Magnetic Resonance (NMR). This grant is awarded as part of a £20 million UK Research and Innovation (UKRI) initiative to establish a national high field NMR network and support the UK’s research in life and physical sciences. It was announced during the official launch of UKRI in London last night (14 May 2018). 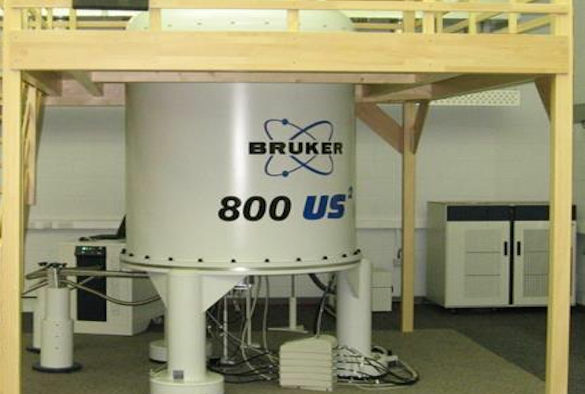 The investment in Liverpool will enable an upgrade of the existing solution-state 800 MHz NMR spectrometer located in the University's NMR Centre for Structure Biology, Institute of Integrative Biology. The upgrade will convert the existing solution-state system to a NMR spectrometer with dual solution-solid state capabilities, thereby strategically differentiating the Liverpool system from other very high field spectrometers in the UK. This project is a collaboration between the University’s Faculty of Science and Engineering and its Faculty of Health and Life Sciences with Professor Lu-Yun Lian and Drs Frédéric Blanc, Igor Barsukov, Jon Iggo and Konstantin Luzyanin forming the core team. One of the aims will be to identify highly relevant problems in materials science, industrial biotechnology, personalised medicine, animal health and food security, and use state-of-the-art NMR technologies to support these areas in a manner to benefit both basic and translational research. Key to the success of this project will be a deeper integration of physical and life sciences to address several of the grand challenges identified by UKRI through the sharing of equipment within the University, and, by providing access to users. The new capabilities of the enhanced system will also enable new research including: study of large complex polysaccharides of industrial biotechnology interest in solution and solid forms (chemistry and life sciences); research and development into new materials (chemistry); development of new biopolymers which could replace chemical products (chemistry and life sciences); metabolomics of solid tumours and tissues (medical sciences); molecular characterisation of the complex systems and aggregates in live cells (life sciences). Professor Lu-Yun Lian added: “We have committed to UKRI to share this new 800 MHz facility equally between life and physical sciences, and we hope the facility will demonstrate how research addressing some of the big challenges can be truly tackled by integrating the two disciplines. This is a very exciting opportunity for us here in Liverpool as well as nationally”. The University is one of eight UK universities awarded a total of £20 million investment in NMR research infrastructure.